Earlier in the year, as gales threatened the prolific blossom on the fruit trees, I wondered whether the small numbers of bees would have had enough time to pollinate the blossom before it blew away. Last year an early unseasonably warm spell followed by extended bad weather put paid to any fruit forming on the trees. But this year I had optimistically hoped for a reasonable fruit harvest. 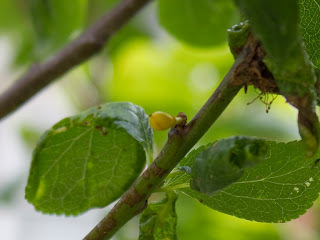 My fruit trees are now 4 or 5 years old and it can take several years for plums and pears to start cropping. The Braeburn apple trees gave us a small handful of fruit a couple of years ago (but nothing last year) and the Morello cherry trees seem to have fruited well but, who knows, most of the fruit falls or, I suspect, is eaten by birds. The pear and plum trees have never yielded a single fruit ... so far. Do you remember the lemon tree that I brought in from the cold 18 months ago? It continues to live behind glass on the stairwell outside my flat and has recently produced several flowers which are slowly becoming tiny lemons. A novelty, I'm sure, but still lovely to see! By next year, I hope I'll be able to add more fruit to this list as I've planted out a rhubarb (Glaskins Perpetual, grown from seed) which has taken very well, a red gooseberry bush and a Honeyberry bought new this year at the RHS show in February. I'm not expecting fruit this year but should have some strange bell-shaped blueberry tasting fruit next year. It's a plant that Mark Diacono highly recommends in his book 'A Taste of the Unexpected' so expectations are high. I've also added a Chilean Guava (Ugni molinae) earlier this year. It's growing in a pot so that it doesn't get overwhelmingly large - in due course these plants can reach 2 metres high in the right conditions. It fruits in the winter so that's another one to look forward to, possibly next year, hopefully this one. I've just realised that it's the end of the month - June! gone already!! - so I'll post twice today and try to get an end of month view up. Symphytum officinale, or comfrey as it's better known, is one of the those plants that was on my 'must have' list for the garden. I bought a sturdy little plant from Jekka McVicar's Herb Farm last year and, forewarned, planted it into a large pot (rather than the ground where its huge tap root can make it difficult to get rid of). This year it's grown huge and flowered prolifically, bringing a splash of early colour to the veg patch and, as I pottered around on Saturday, I noticed that it was enticing many bees into the garden too. This morning, a friend asked me what the plant was - it's very beautiful at the moment, with loads of purple flowers. I answered that it was both the gardener's friend and foe. Compost activator, beneficial mulch for fruit trees, soil enhancer for potatoes and beans when chopped up and buried in the soil under the plant, raw material for liquid fertiliser; balanced against that, it can be a bit invasive and has a hugely deep tap root making it virtually impossible to get rid of once established. I've used the chopped up leaf method under my potatoes this year. Because the leaves were chopped up, they'll decompose quickly releasing nutrients into the soil that boost leaf production; more leaves, more potatoes. Let's hope it works! It's also said that slugs love munching on comfrey leaves so it could be a good idea to lay a carpet of leaves on the soil, wait, then slip out at night (or early morning) and roll up leaves and slugs in one go for disposal. Now that's got to be worth a try! I think, being carefully planted, my comfrey is more of a friend. I've also read that the plant is excellent for healing cuts and arthritis - has anyone tried it for this? I'd be very interested to know what you found out! If interested to read more about this plant, there's an excellent info page over at Seedaholic. Can you see him? I have a sweet rocket (Hesperis matronalis) growing in a large pot on my balcony. It's a biennial which means that I've had to wait two years to see it flower. The flowers are edible, beautiful and sweetly perfumed in the evening. To keep the plant flowering, I deadhead as the flowers fade and was doing exactly that when I spied this little pale green creature, basking in a pool of sunshine on one of the stems. I can't see any munch marks in the leaves so presume he hasn't started feeding on this plant yet. As the plant is part of the brassica family, its leaves are very attractive to caterpillars; the nectar in the flowers is a delicious bonus. Apparently they're also partial to a nice lettuce leaf and I have lots of salad leaves growing on the balcony for my salad challenge. I'm afraid he has to go as I don't want my plant decimated. I'll pop him downstairs when I go; there are plenty of cabbages that have gone to seed and seem to have been abandoned by a 'gardening' neighbour - I think the little caterpillar will be very happy there! Cake, Sunday, the Fringe benefits. Chelsea Fringe, now in its second year, has been offering up a range of creative garden themed events over the past two weeks. One of the events that I've been looking forward to was the Cake Sunday organised by Naomi of Outofmyshed blog. Her community gardening project, the focus of her excellent book Veg Street, hosts regular cake and tea events for local residents to get together and share garden chat. Last year and this, as part of Chelsea Fringe, the street has welcomed members of the public to have a good gawp at their lovely front gardens and planted tree pits in the pavements, eat cake, drink tea, make seed bombs and have a good chat. This year the event also boasted a grand opening by a group of Chelsea Pensioners and singalong entertainment from allotmenteer and songstress Jo Stephenson. Various recipes using garden grown ingredients were considered: should it be my summer fruits traybake or perhaps Jono's almond topped rhubarb cake? I would have loved the recipe for the carrot and courgette cake which a local café serves but in the end opted for this lemon and polenta cake which I topped with edible flowers and petals held on with a lemon glaze. Once over at the event, I dropped the cake off and quickly locked my bicycle. I'd missed the grand opening by the Chelsea Pensioners (thanks to faffing around collecting edible flowers) but was in time to hear some hilarious songs by the singing allotmenteer, Jo Stephenson. I'd spied this fabulously retro-frocked and wellied up creature chatting to visitors as I supped tea with some friends I'd bumped into. Jo kept us entertained with her true life songs of stolen marrows, slugs and Alan Titchmarsh (not necessarily in the same song), standing among the potatoes and alliums of the disco ball community rock garden. Jo and her singing partner Dan have a show called 'Can You Dig It?' on next Saturday, 8th June in Bethnal Green. Whilst everyone was gathered round, it was the perfect opportunity to present the awards for the best planting in a tree pit, with a small trophy presented to each of the three recipients. As I understand it, judging by the Curious Gardener and Veronica from Which? Gardening was firm but fair. Monocultures not allowed. Diversity of planting gaining extra points. Colin is a hard man to sway. 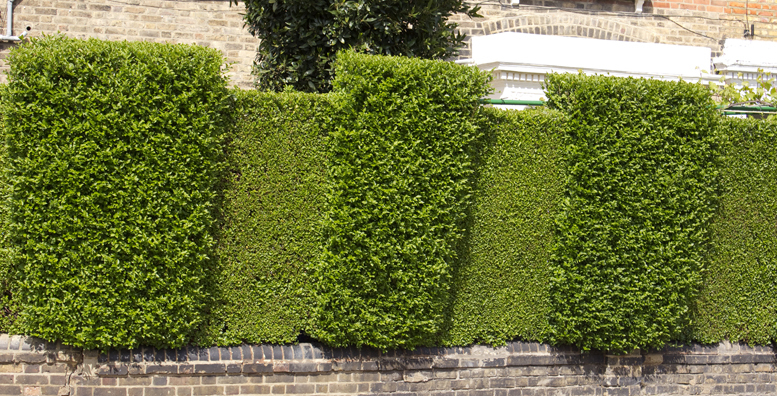 Earlier in the day, local resident Tim Bushe had demonstrated his topiary cutting; I already knew of the elephants that he'd created and wanted to pop back for a closer look. I absolutely love them - if I had a large scruffy privet hedge, I'd want my own herd. 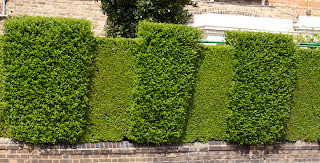 Another hedge had been clipped in a vertical box design with an arched entrance to the garden and reminded me of Christopher Bradley-Hole's clipped show garden for the Telegraph at Chelsea. That just left time for a quick tour of the neighbourhood front gardens; the project has encouraged many households to grow both edible and ornamentals and to create gardens they're proud of. There are some lovely gardens in the street - out of many, these three caught my eye and I was able to have a quick chat to one or two of the owner gardeners. Lovely juxtaposition of colours in this garden, especially the way the slate mulch echoes the colours of the planting. Thriving plants in this garden get morning sun and are well tended by an enthusiastic owner. I was invited through to see the back garden which is even lovelier with extremely well stocked borders. This corner plot was untended a few years ago and slightly letting the show down. Now planted up with strawberries, potatoes and ornamental perennials (and disco rock balls! ), it's a visual treat. It was a wonderfully fun afternoon with a great community ethos - ideas that could be taken up by anyone wanting to get to know gardening neighbours better (we gardeners do love a good horticultural chat!). As I cycled off back to reality (last minute supermarket shopping), some of the crowd had dispersed towards another Fringe event - a foraging walk at nearby Islington Ecology Centre - which Naomi had kindly reminded us about - another example of community spirit.